Review: When Marcie goes to her grandparent’s house to spend the summer at Lake Pappakeechee, something extraordinary happens. Marcie soon finds out that Mr.Swyndall is going to destroy James Bay! Marcie knows that she has to stop Mr. Swyndall, before most of her greatest childhood memories are lost. Join Marcie in Indian Summer written by Tracy Richardson, an exciting fictional story with history and fun! Marcie knows it will be a summer that is the same as all of her summer vacations, B-O-R-I-N-G. What she doesn’t know is that Kaitlyn Swyndall and her family are staying in their summer home across the lake from where Marcie is staying. When Marcie soon finds out that Kaitlyn’s dad is going to destroy James Bay, Marcie knows it is up to her. Marcie seeks out help from her friend’s dad, Al, her brother and her family. But when something bad happens to Al, a neighbor, Marcie finds something that will stop Mr. Swyndall from destroying James Bay. Overall, I think Indian Summer is a fantastic story. The author is very talented person because she has gotten my whole family interested in her book. The book has no bad language or scenes which I thought was good. The author was very descriptive about the scenes in the story. My favorite thing about the book is that she used history about the Adena Indians. I really enjoyed learning history in a fun way. Another thing I really liked is that the book is appropriate for all ages. Indian Summer is one of the best books I have read for a long time. I have read many books but this one is fantastic. If I had to rate this book I would give it 10/10 stars because it was so good. I think everyone should read Indian Summer because it is an extraordinary book. Review written by Sheila (6th grade student). We would like to thank MM Book Publicity for providing a copy of Indian Summer for this review. Have you read Indian Summer? How would you rate it? I think some of the best mysteries, or even books in general, are those that both entertain you and teach you something new about a person, people, place, or time. This sounds like one of those books! 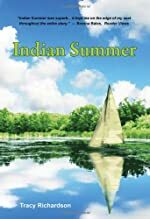 And here's an interesting link, http://mybookthemovie.blogspot.com/2010/01/tracy-richardsons-indian-summer.html, where the author imagines her novel as a movie and who might play the characters in the book.